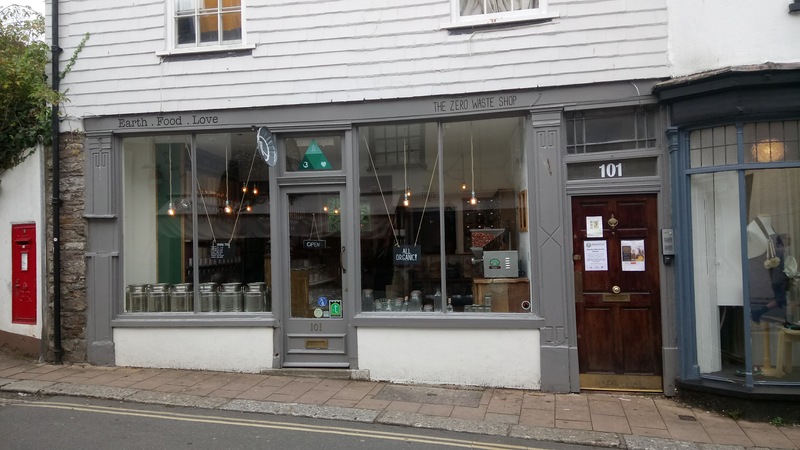 We were eager to try out the new zero waste supermarket in Totnes as soon as we heard about it. Reducing our plastic use is really important to us and any new shop that helps us kick the habit is great. The practice of buying from bulk bins went out of favour in the UK when I was a kid. Everything started arriving in plastic packages. A few remained in old fashioned grocers and health food shops but most have gone. In the past year or so we’ve noticed something of a comeback. 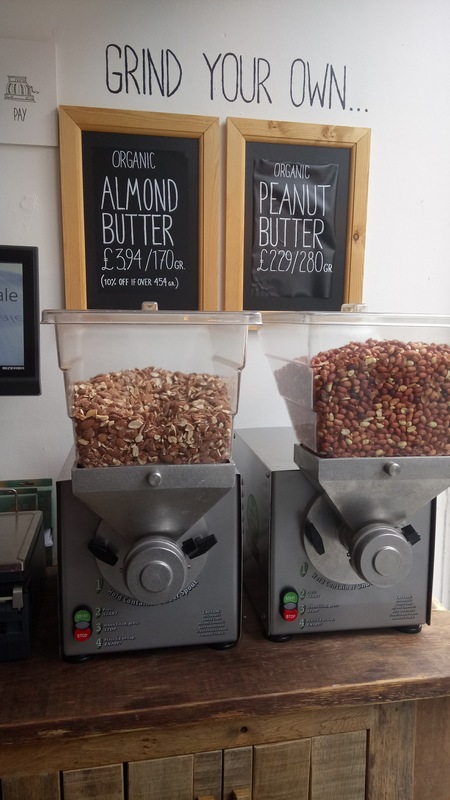 As well as Earth.Food.Love there are also a few bins in Exeter’s The Real Food Store. Earth.Food.Love though is 100% waste free. So what can you find there? We just went in of a nosey about but the range was impressive. You’ve got your spices, your flours, your grains – all that you’d expect – and then you have the stuff that isn’t as standard but is really impressive. They have cacao covered raisins. They are amazing. Kate prefers the cacao covered almonds but she’s wrong. The raisins are incredible. On the more practical side of things there is a section of liquids, things like tamari, agave and maple syrup. They have cleaning supplies too – loo cleaner, laundry detergent, – all served without plastic. You can bring any container with you and get it weighed but if you’ve forgotten yours or you just don’t have a dedicated arborio rice tub then you can buy any number of lovely containers. If you’re carrying things a long way then you can pick up onya weigh bags or use their paper bags. They also have the most lovely tea caddies. I was also delighted to find reusable straws. I took a metal one and a cleaning brush home with me. The staff are friendly and on hand to help with the dishing out and weighing of your shopping but it was so easy to work the scales. As usual the only problem we had was remembering what we needed to buy. We’re already planning to get as much of our food from here as we can but if you are still sceptical then I have two more arguments for you. One is that Earth.Food.Love is owned by Vegan Northerners. The other argument is this: they sell nutritional yeast. Earth.Food.Love is based in Totnes.